Rebecca Evans was born in South Wales and studied at the GSMD. Previously for ENO: Rodelinda, Donna Elvira, Governess The Turn of the Screw, Ginevra Ariodante, Romilda Xerxes. Notable engagements elsewhere: Countess Almaviva, Mimì, Pamina, Despina, Zerlina (ROH); Susanna, Zerlina (Met); Ilia, Susanna, Despina, Ginevra (Bayerische Staatsoper, Munich); Despina (Deutsche Staatsoper, Berlin); Pamina (Lyric Opera of Chicago); Anne Trulove, Adina L’elisir d’amore (San Francisco); Marschallin, Countess Almaviva, Mimì, Liù, Gretel, Pamina (WNO). 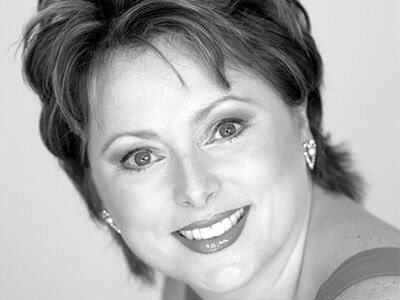 She has sung at the BBC Proms and at the Edinburgh, Salzburg, Tanglewood and Ravina Festivals, and her concert appearances include the Hallé with Elder, the LSO with Gardiner, the Leipzig Gewandhausorchester with Blomstedt, the Accademia Nazionale di Santa Cecilia with Pappano and the OAE with Mackerras. A Grammy Award winning artist, she has recorded prolifically. Elsewhere this season, engagements include First Lady Die Zauberflote (ROH) and Alice Ford Falstaff (RLPO/Vasily Petrenko).